Did you know that Wisconsin’s dead urban trees could produce over 73 million board feet of lumber each year? Unfortunately, most trees removed from our cities and towns are usually fated for the chipper. The Rescued Wood Program of Habitat for Humanity Wisconsin hopes to change that protocol by saving and recycling the best logs and creating a wide variety of remarkable resources and products. In partnership with the City of West Bend, WI, Habitat for Humanity of Washington, and Dodge Counties receives the city’s trees contaminated by the emerald ash borer or other pests. The city graciously delivers the logs to Habitat’s sawmill. In January 2015, Habitat for Humanity Washington and Dodge Counties of Wisconsin received a grant from the Wisconsin Department of Natural Resources (DNR) to begin operating a sawmill in Kewaskum. Since then more than 20,000 board feet of milled lumber has been processed with the help of more than 100 volunteers. The direct connection of the project to the non-profit organization Habitat for Humanity was formed by conscientious stewards of both the land and those who live on it. The need to reduce, recycle and repurpose has long been one of the many goals of the organization. Habitat for Humanity’s overall mission is to build simple, quality, affordable homes in partnership with the community and those in need. The connection between taking the doomed ash trees and creating the end product of trim for the homes built follows this mission on many levels. State and local government agencies as well as multitudes of community organizations have embraced the Rescued Wood Program as an affordable, creative and purposeful project. Evidence of this can be seen in the 2016 build sites for Washington and Dodge Counties. 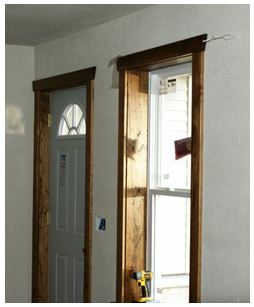 Rescued wood has been milled, crafted and installed by countless volunteers into beautiful mission style trim for the windows, doors and baseboards for the West Bend, Wisconsin Habitat build. Approximately 1,200 board feet of Rescued Wood has been used for this project. There are plans for trim to be created for the Habitat build site in Juneau, WI, as well. 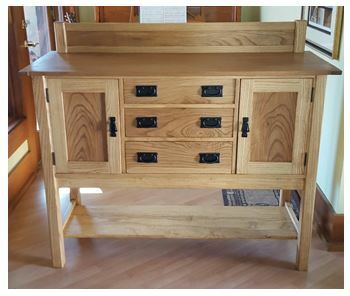 Other Wisconsin Habitat affiliates are exploring options to create cabinetry with the wood. Furthermore, purchase of the Rescued Wood milled lumber and the many other products and by-products of the program through Habitat for Humanity ReStores does more than provide a customer with beautiful, high-quality wood. It makes smart use of local resources. By supporting this program, the Washington and Dodge County ReStores are creating new markets, audiences, positive public relations and opportunities for the Rescued Wood Program. The added benefits include funding builds with increased ReStore sales. Rescued Wood is currently available in five Habitat for Humanity ReStores located in West Bend, Germantown, Beaver Dam, Fond du Lac and Sheboygan. These items bring in new audiences and markets. From the casual crafters and the serious artisans to local taxidermists and fine furniture makers, all have found the high-quality, low-priced wood to be an exciting addition to the ReStore product mix. Many ReStores are beginning to target market the Do-it-Yourself crowd by creating an upcycled and Rescued Wood corner display. Taking a piece of furniture with a surface that has seen a better day and exchanging it for a fresh new look gives the furniture not only more bang for the buck, but a repurposing that is in fashion right now and supported by many different individuals. From die-hard recyclers to purveyors of fine craftsmanship, buyers come in many forms, yet all see the beauty in the “cradle to cradle” concept of the wood. The majority of the wood milled is ash, although there are other species that include red oak, honey locust and elm. Currently the mill offers 4/4 (1”) ash boards in varying widths and lengths as well as 8/4 (2”) live edge kiln dried slabs. Buying directly from the mill, a Restore is charged a $1.00 per board foot for the 4/4 and $1.95 per board foot for the 8/4 live edge as a shipping fee. Exact amounts are calculated at the mill upon pick up. However, the estimate is for approximately $1,000 per kiln load for the 4/4. All lumber is kiln dried in strict accordance with the DNR’s regulations. Other products include firewood which is sold at approximately $60 per cord/pallet; live edge “flitches“ used for signage, crafts, art and taxidermy are sold at $0.50 per board foot. Bags of sawdust (approximately 50 pounds each) are sold at $5 a bag and used for mixing with latex paint to recycle. The live edge materials and firewood are sold only within the State’s EAB Quarantine area. Yet another aspect of this Rescued Wood project involves training and educational opportunities. The mill runs throughout the year and accommodates many groups in search of new skills and volunteer opportunities. The Rescued Wood Program hopes to go state wide in the future with the establishment of other Habitat for Humanity led operations or partnerships with local mills and kiln operations.